Favorite: Convos with your kid everyday! As I was walking through my local grocery store, I happened to pass by their book and gift section, which is always a dangerous proposition for me. 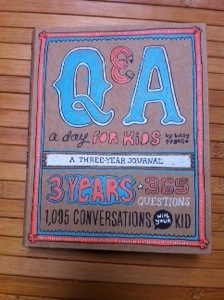 I saw a wonderful book, called “Q & A a Day for Kids” by Betsy Franco. She has done one for adults as well, but the idea of having a question a day for 3 years, equalling 1095 conversations with my child, was really appealing to me. I restrained buying the book that day, but later ordered it through my local book store, Annie Bloom’s Books. 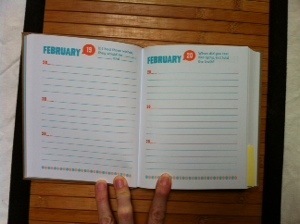 There are spaces to write down their answers for each year. We are sometimes stunned by an answer and his thought process in his answering. He takes it quite seriously and often asks to have his question each day. It will be great to see how his answers change as he matures and to see our bond build even stronger than it has already through honest conversations about questions that can be serious or silly. This will be fun to take on the road with us this summer, and to see how answers are changed by varying environments and schedules. We highly recommend the book! Favorites: Tiny Tool Kits that have everything you need!